Water quality and water source protection are not only important, they are one of the many topics about which the Sisters of Charity of Nazareth are focused on educating the public. Karen Schaffer, with Salt River Watershed Watch, demonstrates how to sample a stream during a recent workshop held at Nazareth. Recently, Nazareth was the host of a training workshop aimed at teaching volunteers how to test local water quality throughout the year. Schaffer said the Salt River group is part of Watershed Watch in Kentucky. The Kentucky Division of Water launched the watershed management program in 1997 as a public outreach effort to enlist volunteers. 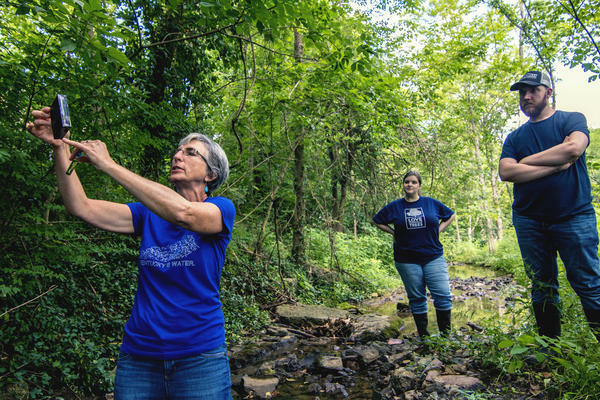 Since its creation, Watershed Watch in Kentucky has trained thousands to assess waterways and promote environmental education. On Tuesday, volunteers spent several hours learning about area water sources, how to test them and what to look for. After the in-class lesson, they were provided test kits and paid a visit to a small stream on campus for a testing demonstration. 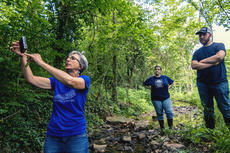 Workshops like the one offered at Nazareth are an important way to recruit volunteers to help monitor water quality, Schaffer said, and the testing can also make for a unique hobby for those looking to explore and learn more about local waterways. The tests measure pH levels, dissolved oxygen, conductivity, bacteria and temperature, which can indicate if the water source is in good condition and needs protecting, or if there is an issue that needs to be addressed. If an issue is found, such as acute pollution, the program works with the Kentucky Division of Water for an emergency environmental response. “If it’s more of a chronic problem, we can investigate and try to identify some sources of the pollution and then work with other agencies and organizations such as the Natural Resources Conservation Service, local sewer districts or stormwater programs” to develop solutions to improve the quality of the stream, Schaffer said. In practice, the trainings have paid off as SRWW volunteers have helped identify, correct and prevent issues in different waterways across Kentucky in recent years. SRWW has also led water improvement projects, such as planting trees, shrubs and grasses to shield streambanks from erosion, provide habitat for wildlife and protect and enhance natural pollution barriers. Those who were unable to attend Tuesday’s workshop but who are still interested in learning more about Watershed Watch can contact Schaffer at kschaf4321@gmail.com or visit www.srww.org.